So you want to do what to the tundra? Heat it, it turn out. The Department of Energy has some experiments running in the lower 48 (that’s the Continental US for you non-Alaskans) which involve heating small patches of land to see what the effects of global warming might be. Better than just wait and see, no doubt, and it would give some guidance about adaptations that might work. Anyway, they are thinking of trying this on the North Slope. For the moment, they just want to test the proposed method in a very small area,less 30 m in diameter. (A meter is just over a yard, about 39 inches, for those who forgot about the metric system when they left school). 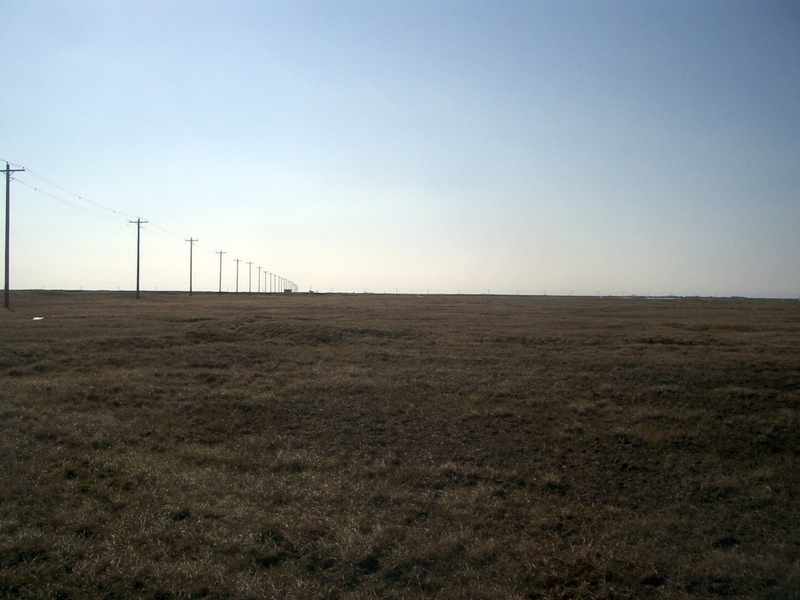 Barrow has many wonderful things, including the Barrow Environmental Observatory, which is 7466 acres of land set aside by the Ukpeagvik Inupiat Corporation, the Barrow village corporation (more about that some other time) for scientific research. It is actually zoned as a Scientific Research District by the North Slope Borough. That’s where DOE wants to test this. So, a plot had to be located. It needed to be near power and a trail. 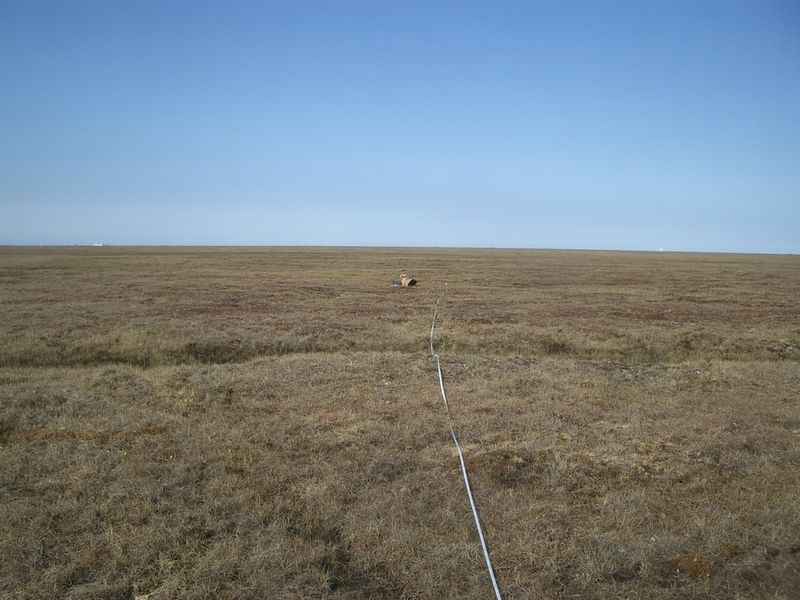 Craig Tweedie of UTEP, an ecologist, found a spot that seemed fit the bill, which had been disturbed in the past by tracked vehicles called “weasels” which NARL scientists used to use to get around on the tundra. Now everyone walks in the BEO when the snow is melted, unless matted trail is put down. The idea with a disturbed site was that it wasn’t much good for other research, so it’d work for testing the warming equipment. The next question is if there are any cultural resources (archaeological or otherwise) on the site. Since I work for the company that owns the land, that’s part of my job. 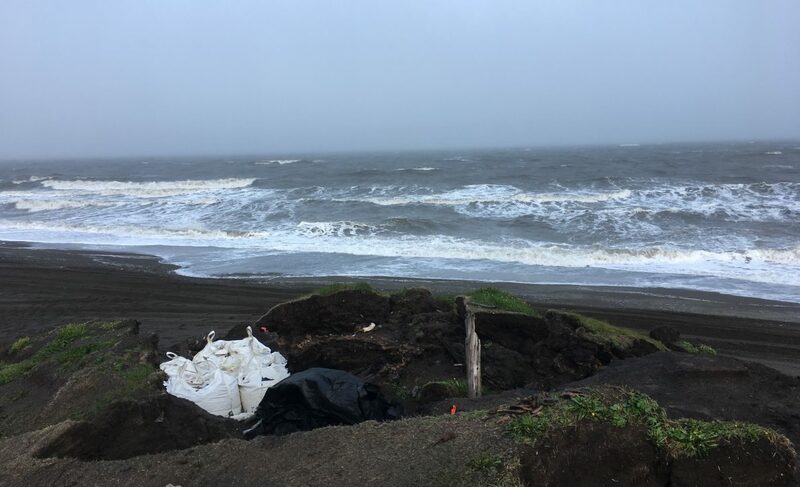 Normally we’d wait until later in the summer when the ground is thawed more and the Nuvuk field season is over, but they’d like to try to install the equipment soon. So I went out this afternoon to look at the place for the first time and see what was what. There were a few pictures, but I guess archaeologists look at things differently. I had a GPS location for the center point, so I programmed it in, got a 30 m tape and pin flags, and set off. First I drove to a pull-out on Cakeater Road, parked the truck, and took a half-mile or so hike into the BEO. There is boardwalk part of the way, and matted trail goes right past the site, although it isn’t very level, since the tundra it is built on is fairly lumpy and shifts a bit over time besides. However, it’s been such a late melt that a lot of parts of the trail were under water, so I had to do all this in Xtra-Tuffs & rain bibs. I’ve been coming down with something the last few days, so I really just wanted a nap, and wasn’t exactly looking forward to this little excursion. Luckily, the sun came out for what seems like the first time in days, and it was actually fun, although I took an amazingly long time to do it. Then I had to turn around and hike back to the road :-(. There were lots of birds around, and the buttercups and willows were in full bloom, so all in all a good day. Looking back toward Cakeater Road from the site. My truck is the teeny-tiny thing at the end of the power line. Once I got there, I put some chaining pins into the center point, and ran out a circle around it with a 25 m radius. The actual equipment is going to be a hexagon with about a 25 m max dimension, so this gives room for construction and a little wiggle room. I walked the whole thing in really close transects, much to the annoyance (verging on hysteria) of a shorebird which must have a nest nearby. Based on this inspection, it looks good for the tundra warming experiment. The only evidence of human activity on the site was the aforementioned weasel tracks, a crushed 55-gallon drum, and a flattened tin which probably held Blazo once. The area was pretty damp, and there was higher, drier ground nearby, so it’s unlikely to have any significant pre-NARL activity when we test. The tundra near Barrow (with my tape stretched out). Pizza & baklava, and so to bed. Posted on July 2, 2010 by Anne JensenPosted in Archaeology, Arctic, Barrow, scienceTagged Archaeology, Arctic, Barrow, BEO, science.